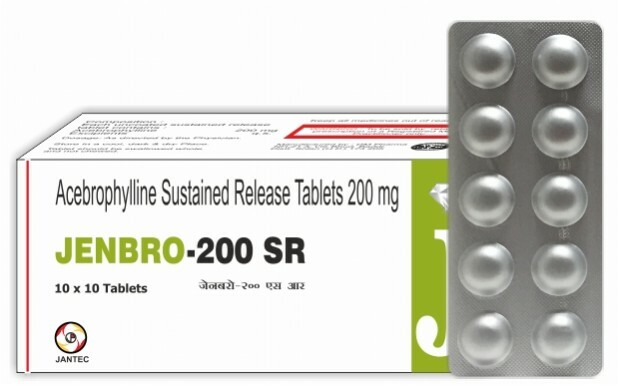 Acebrophylline, a xanthine derivative, is prescribed as a bronchodilator for the treatment of bronchial asthma and COPD in adults. Acebrophylline alter mucus gel secretion phase by lowering viscosity and increasing the serous gel phase. By augmenting ciliary motility, Acebrophylline increases the mucociliary clearance. For Bronchial asthma and COPD (Chronic obstructive pulmonary disease). Theophylline-7-acetate has a bronchodilator effect due to inhibition of the intracellular phosphodiesterases, followed by an increase of adenosine monophosphate cyclic levels, which promote the relaxation of bronchial muscles. It increases the mucociliary clearance by stimulating cilia motility, as ambroxol modifies the mucous gel phase of secretions by decreasing the viscosity and increasing the serous gel phase. Acebrophylline inhibits phospholipase A, and phosphatidylcholine leading to lesser production of the powerful pro-inflammatory substances like leukotrienes and tumour necrosis factor. By inhibiting the synthesis and release of these inflammatory mediators, acebrophylline reduces inflammation, a key factor in airway obstruction, specially in chronic forms. Acebrophylline inhibits intracellular phosphodiesterase associated with cAMP levels and facilitates bronchial muscles relaxation. Acebrophylline selectively inhibits phosphatidylcholine and phospholipase A, TNF-alpha and leukotrienes. Inhibition of such pro-inflammatory mediators can significantly reduce the airway inflammation and obstruction in chronic stages. After oral administration of acebrophylline, the two components of the molecule ambroxol and theophylline-7-acetic acid are released in the stomach and absorbed in the intestine, reaching optimal concentrations of ambroxol within 2hrs and of theophylline-7-acetic acid after 1 hr. The plasma half life varies from 4 to 9 hrs after oral administration. The drug is metabolized in the liver and eliminated renally. Acebrophylline should not be prescribed concomitantly with lincomycin, clindamycin, erythromycin, allopurinol, barbiturates, quinolone derivatives, oxytetracycline, cimetidine, furosemide, anticoagulants, oligomycin, phenytoin and reserpine. Patients administering Acebrophylline might be affected by some adverse events. You must report all reactions that occur to your physician. A list consisting of some examples is given here: Abdominal, discomfort, stomach/ abdominal distenson, vomiting, diarrhea, constipation, heart burn, loss of appetite, esophageal bleeding, rashes, urticaria, itching, drowsiness, difficulty in breathing Consult your physician immediately if any serious side effects are noticed while you are undergoing treatment. Acebrophylline is contraindicated in patients with hypotension, acute myocardial infarction, impaired hemodynamics, hepatic or/and renal disorders, Ambroxol allergy, GI disorders, convulsion, arrhythmia, CAD, cardiac insufficiency and hyperthyroidism. Acebrophylline is contraindicated in pregnancy. Nursing mothers should consult a physician before taking Acebrophylline.